Ahh what to do when life keeps throwing lemons your way? I would usually make a some "sweet" lemonade, but right now I'm just too tired!!!! These past couple of weeks have been very, very busy. Cole and Brock are getting close to finishing school and are both very busy taking test after test. 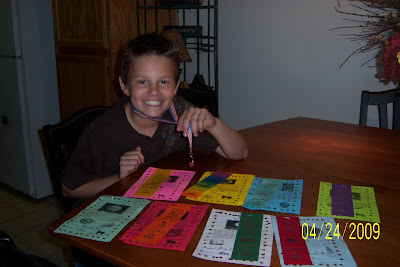 In between studying, Brock finished the schools J.A.W.S program in 2nd place winning a medal! If your wondering what J.A.W.S is....it's basically a program that award kids for every mile they walk or run at school. Brock ran 135 miles putting him 2nd in the whole school!!! Pretty awesome! 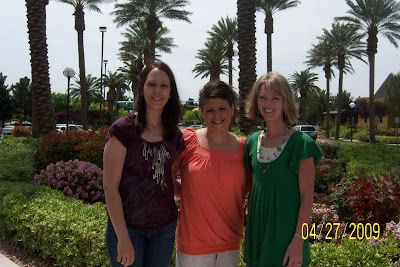 We also had some old friends visit us....my dear high school friends, Jenn Campbell, Angie Field and Kim Longhurst(not in the picture cause she left early) came to hang in Vegas! We spent 3 days talking, shopping, eating and talking some more. They even got "scared" Christie to go to the top of the stratosphere and ride the "wonderful" rides. They loved every minute, I thought I was going to die! Honestly it was wonderful seeing them and spending time together. I think we've decided to make this a yearly tradition. Last Tuesday, Jeff and I took the kids swimming at our pool. I decided to run to the store to get treats and while gone, Zach decided to put his hand in a uncovered 2inch vacuum hole in the pool. Zach quickly realized his hand/arm were stuck and screamed for his dad. Jeff and another man desperately tried freeing him for several minutes worrying they were going to break every bone by pulling so hard. Once Jeff heard Zach say "daddy I'm just going to die" he decided to yank his arm out with all his strength. I got back to the pool just a minute later and we rushed Zach to the emergency toom. After a very scary, long night in the ER and seeing a specialist the following morning, it looks like Mr. Zach will be making a full recovery. The color and swelling are getting better everyday with elevation and massaging! I can't tell you how thankful I am to have my sweet little boy with me! I have never known fear like that and I pray I will never again. Here's a picture of his injury..
We got Zach home and thought all was settling down when Jeff and Cole found themselves broke down in the Altima off I-95. Our little "Sally" has been our car since Cole was born and we knew she was getting old, but we hoped she could hold out for a little while longer....but nope, she's done! We are still looking into all of our options, but it looks like she has driven her last mile! Which leads me to the final "lemon" of the week...I went to work on Saturday afternoon and was handed termination papers! My two direct supervisors finally decided that I was not worth keeping around and fired me listing "unsatisfactory job performance" as the reason! I knew this would be coming, but I'm still shocked by all of it! I knew that my career was going to end and I could resign with my head held down or get fired with my head held high. My head is high because I was fired for speaking the truth, upholding my values and defending those who couldn't defend themselves. For the next few days, I'm just going to breathe and try to digest everything! So...hopefully the Mason family will be spared some "lemons" for a little while, so we can use up the ones we already have! Sorry Chris! Things will get better. Did you invite people to view your blog? I made it private for you. I did! I think i did it right. Who's knows, maybe you could look and see? Chris, I am so sorry you have had to endure so much lately! What a crap deal! But, I really do believe all things happen for a reason...it will all work out in the end. Until then, keep breathing and resting. Think of it as a mini-vacay....relax by the pool, make a fancy dinner, take the kids to the park, make them pancakes for breakfast...all the things you didn't get to do cuz you were sooo busy with your dang job. I love ya! Did you get a new kitchen table? It looks nice! I ditto Em!! Things will be better and I am sure Jeff is LOVING having you home w/ him.